How are you all?Wishing you Happy Week:) I love to Cook, and Quality Kitchen Accessories, are super important for me.Do you remember when I got my Premium Chef Knives? It was much easier to cut and prepare the ingredients.I understood, how important to use Good Quality products. I always wanted a Nice Real Bamboo Board, they are the Best. Bamboo boards are 100% Organic, Natural. Did you know for example that bamboo cutting board resists staining and bacteria growth? Finally I have my own Anti-mildew Bamboo Cutting Board from Amazon. This Vertical Bamboo Cutting Board measures 18x13x0.7 inches has antibacterial properties. The unique design of the 2 stands and the handle help save space and avoid being mildewed. The non-slip wood cutting board is BPA free and made without harmful toxins. 100% Food Safe - No Formaldehyde - Satisfaction Guaranteed. This strong bamboo cutting board will neither crack, slide easily or splinter to every where. Good for vegetables, bread, fruit, turkey carving, and meat carving. 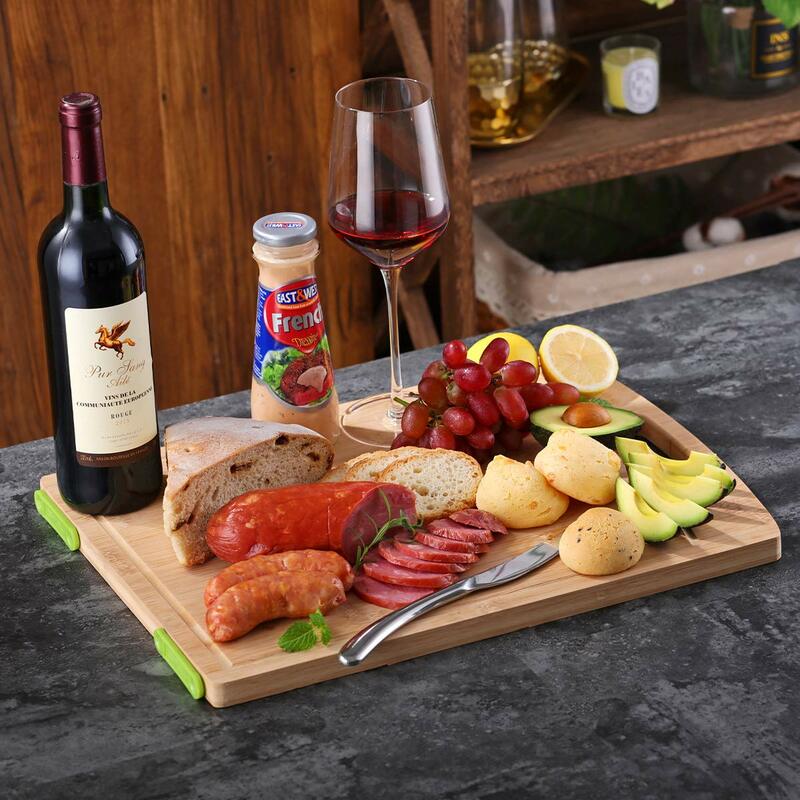 The cutting board is ultra strong, attractive, versatile, durable and lightweight construction. Great gift idea for weddings, housewarming, retirement, birthdays and Christmas gifts for ALL kitchen enthusiasts. We have to be always sure that our Health is safe, during using any Kitchen products. and this BAMBOO CUTTING BOARD is just perfect. These Features Tells Everything, Why this Board is the Best. I was 100% sure that I want to have at my Kitchen. Tired of moving things off from the board for more work space? Don't you hate your board go moldy after being used for a long time? When pieces constantly fall off the side of the board? Fruit and vegetable juices running off all over your counter add to the turmoil even more. These concerns are all gone with our large size vertical bamboo cutting board. This board is FDA Approved, BPA Free and made from natural Bamboo. It's vertical anti-mildew design and life handle design make it avoid getting moldy after being used for a long time. Also never worry about small pieces falling off your board on the side. It's really a perfect, healthy and professional kitchen tool for any cook! With a large size of 17.2 X 13.2, this cutting board is wider than most other brands. It can truly meet your needs for extra space without moving things off from the board. Our board also comes with a carefully package. It's the perfect gift for family and friends. Bamboo is actually a fast-growing hard grass which makes it a sustainable renewable resource. It needs no chemicals to thrive or be harvested, thus raw bamboo never contain harmful chemicals. It is a healthy and environmentally mateial. Unlike wooden cutting board, this bamboo cutting board resists staining and bacteria growth. Perfect kitchen tool for home cook and professional chef. The Size of the Board (17.2 X 13.2 Inch) is just Perfect, Big and very Comfortable while I cut Veggies and Prepare the Food. I would Like to Highlight The Vertical Standing Up Features, because it is so important to prevent mould. For me is super import that the Material is 100% Natural, Organic, Bamboo and that cutting board resists staining and bacteria growth. The Dip Grooves function works very well, the board after using is not with full of liquids. The Crack-Splinter Free function works Amazing. Such a Big difference between this Bamboo Board and the Wood one what I used before. Love how easy to use, cut the Fruits, veggiees on this Board. Perfect gift Idea to every House, My mum will Love for sure, when I get her one for her Birthday. What type of Cutting Board do you use at home? Did you ever tried Bamboo?